Ph.D., Texas A&M University. (Sociology) 1998. M.A., Baylor University. (Sociology) 1993. B.A., Baylor University. (Sociology) 1991. Dr. Robyn Driskell is currently serving as Vice President for Internal Administration and Compliance and Chief of Staff. She joined the President’s Office in June of 2016 as the Executive Director and President’s Chief of Staff. Dr. Driskell also served as Vice President for Board Relations in 2016-2017. She earned her Ph.D. (1997) in sociology from Texas A&M University, and her BA (1991) and MA (1993) from Baylor University. 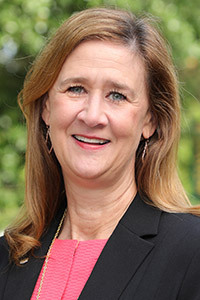 As Vice President for Internal Administration and Compliance, Dr. Driskell oversees a number of departments and offices, including the Equity Office, the Title IX Office, University Compliance and Risk Services, the Office of Internal Audit and Management Analysis, and the Department of Public Safety. She also serves as the chair of the President’s Diversity Council. Dr. Driskell began her career at Baylor in 1997 in the department of sociology as an Assistant Professor and then Professor of Sociology. She then served as Divisional Dean for the Humanities and Social Sciences in the College of Arts and Sciences. As Divisional Dean, her responsibilities included faculty issues, faculty interviews and hiring, and tenure reviews. Additionally, she worked closely with departmental chairs, departmental matters, personnel issues, and annual evaluations. She has also served in various capacities at Baylor University as the Executive Associate Dean, Graduate Program Director, Interim Director of the Institute for Church State Studies, and the Coordinator of Academic Assessment for SACS Accreditation. Her scholarly research interests include community, demography and Latino studies. She has several peer-reviewed journal articles on these topics. Her books are entitled "The Community in Urban Society" (2012), “Women’s Encounters with Globalization” (2012), and "The Discourse on Applied Sociology" (2007). She was awarded the Outstanding Professor Teaching Award (2002) and the Outstanding Graduate Program Director Award (2008) at Baylor, plus several competitive summer sabbaticals and research leaves. She has served her sociology professional society in a variety of roles and was President of the Southwestern Sociological Association in 2008. Larry Lyon and Robyn Driskell. 2012. Community in Urban Society. Long Grove, Illinois: Waveland Press, Inc. ISBN: 1-57766-741-7. (282 pages). Das Gupta, Samir, Robyn Driskell, Yvonne Braun, and Nicola Yeates (eds.). 2011. Women’s Encounter with Globalization. London: Frontpage Publications Limited. ISBN: 978-81-908841-8-1. (230 Pages). Das Gupta, Samir and Robyn Driskell (eds.). 2007. Discourse on Applied Sociology: Theoretical Perspectives (vol. 1). London: Anthem Press. ISBN:13-978-1-84331-254-3. (276 pages). Das Gupta, Samir and Robyn Driskell (eds.). 2007. Discourse on Applied Sociology: Practising Perspectives (vol. 2). London: Anthem Press. ISBN:13-978-1-84331-275-8. (237 pages). Brittany Fitz, Larry Lyon, and Robyn Driskell. 2016. "Why People Like Where They Live: Individual-and Community-Level Contributors to Community Satisfaction." Social Indicators Research 126:1209-1224. Driskell, Robyn. 2015. “Sociology and Applied Sociology.” In B. Turner, C. Kyung-Sup, C. Epstein, P. Kivisto, W. Outhwaite, and J.M. Ryan (eds. ), The Encyclopedia of Social Theory. New York: Wiley-Blackwell, Inc. (8,500 words). Forthcoming. Driskell, Robyn. 2014. “Telephone Surveys.” In N. Balakrishnan, P. Brandimarte, B. Everitt, G. Molenberghs, F. Ruggeri, and W. Piegorsch (eds. ), Wiley StatsRef: Statistics Reference Online. September 29, 2014. (3,000 words). Originally published in 2005 in Encyclopedia of Statistics in Behavioral Science. London: John Wiley & Sons, Ltd.
*Driskell, Robyn, and Larry Lyon. 2011. “Assessing the Role of Religious Beliefs on Secular and Spiritual Behaviors.” Review of Religious Research Journal 52, July (4): 386-404. Das Gupta, Driskell, Braun, and Yeates. 2011. “Introduction.” Pp. 1-26 in Das Gupta, Samir, Robyn Driskell, Yvonne Braun, and Nicola Yeates (eds.). Women’s Encounter with Globalization. London: Frontpage Publications Ltd.
*Driskell, Robyn, Larry Lyon, and Elizabeth Embry Ɨ. 2008. “Civic Engagement and Religious Activities: Examining the Influence of Religious Tradition, Participation, and Beliefs.” Sociological Spectrum 28: 578-601. *Driskell, Robyn, Elizabeth Embry Ɨ, and Larry Lyon. 2008. “Faith and Politics: The Influence of Religious Beliefs on Political Participation.” Social Science Quarterly 82(2):294-314. Outstanding Graduate Program Director, The Graduate School, Baylor University. 2008. Outstanding Professor Teaching Award, All-University, Baylor University. 2002. President of Southwestern Sociological Association. 2008. Primary Professor Award. Elected by Freshman students. Baylor University. 2000. Teaching Award and Honorary Football Captain. Athletics Department. Baylor University. September 20, 2003. Summer Sabbatical (funding 20% of salary). Baylor University. 1998, 2001, 2003, 2007. Research Sabbatical, Baylor University. Fall 2004. Summer Faculty Seminar (funding 20% of salary). Seminar on technology in academia. 2003. Summer Research Award (funding 10% of salary). Baylor University. 1999, 2000.